Cris Wesley Love Jr. was born May 23, 1982 in Lubbock, Tx. and passed away on June 14, 2006 at the young age of 24 after a short battle with cancer. Cris grew up in Round Rock, TX and graduated from Round Rock High School in 2000. Cris played football, basketball and baseball but his true love was football. 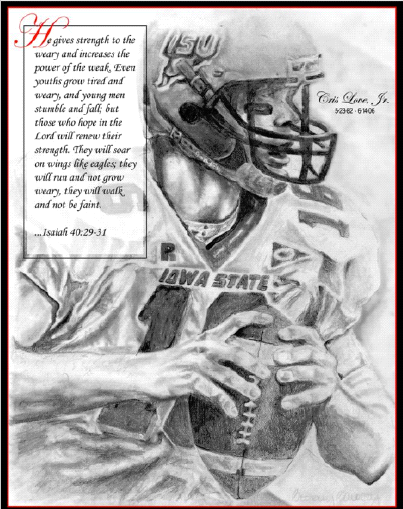 He excelled as a quarterback and received a football scholarship from Iowa State University and graduated with a Bachelors degree in Health and Human Performance in August 2005. Cris also had a big passion for fishing and golfing. Cris loved the Lord and grew up as a member of the First Baptist Church of Pflugerville. He had such a kind and loving spirit and was immediately loved by anyone he met. He was blessed with so many friends and would be humbled and honored at the outpouring of support for him and his family. His parents, Melynda and Cris Love Sr., have chosen to annually award scholarships to help further the education of others and to memorialize their son. Thank you for your support of the Greater Round Rock Community Foundation. You are accessing a secure page. All information is encrypted for your protection.